Looking for souvenirs? Rare art? Beach dresses? Anything that screams Goa? Well, after many a shopping sprees, we've curated a list of stores that keep calling us back. A design collective that was quite the pioneer of the ethical, slow fashion movement, even before it was called so — People Tree stores ethically made, fair trade clothing and accessories that are inspired by ethnic design sensibilities. From books to clothing to accessories to home decor — this eclectic store that shares the compound Gunpowder, is a powerhouse of revolutionary art. Founded by Gurpreet and Orijit, both themselves multidisciplinary artists, you will find everything from screen printed, to batik to handblocked clothes and scarves to upcycled/recycled fashion accessories, to footwear made from natural materials to rare finds in music, books and documentaries, here. Paperboat collective in Sangolda is easily one of Goa’s must-visit design stores. It houses a series of quirky textiles, jewellery, furniture, unique ceramics, as well as home decor, children’s clothing and toys and a wide array of lifestyle products and art pieces. One guiding principle that runs through all of the collection at Paperboat is the quality of the product as well as the faith in the individual behind the label. 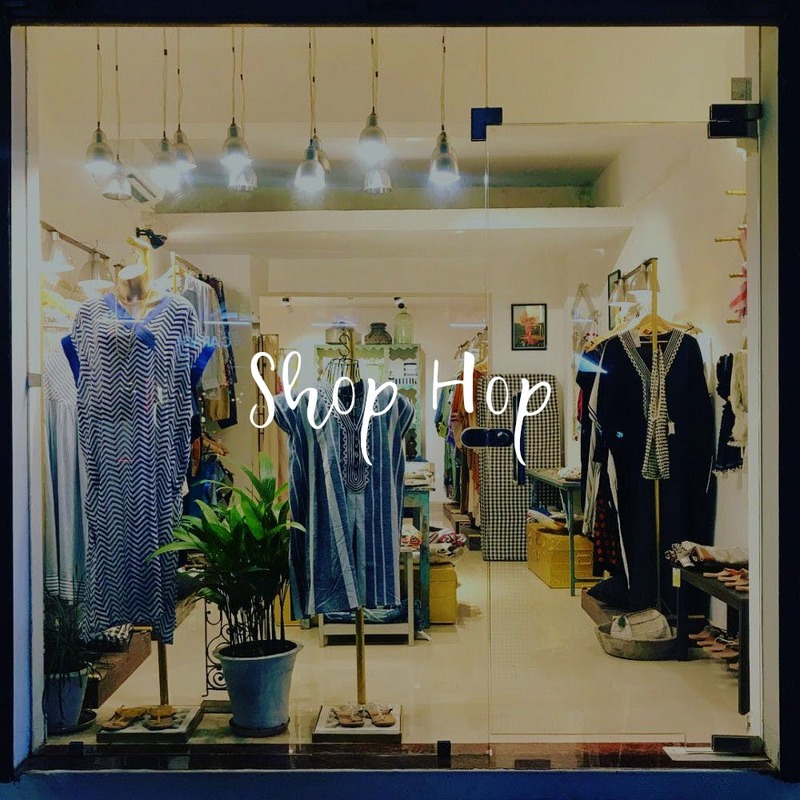 Each piece at the store brings with it, its unique design aesthetics, and is curated by the owner-founder Bhagyashree Patwardhan, from various Indian based designers and smaller lesser-known studios doing stellar work. A clothing store that boasts of being 100% organic, 100% fair trade, No Nasties sells luxurious cotton garments for men, women as well as children. Guided by simplistic and sustainable design principles, the store stocks what is called ‘vegan clothing’. Brainchild of combined skillsets of Apurv and Shweta, everything from packaging, to the tags to the actual product is made from organic cotton with no genetically modified (GMO) seeds, no carcinogenic pesticides, no toxic dyes and no unfair business practices. Naturally the price tag is slightly higher than your average stores, but keep in mind that with every purchase you’re contributing to strengthening the conscious fashion movement. A lifestyle store that’s housed in the same compound as the cafe, Artjuna, is a boho-shopper’s delight. What began as a workshop space for the owners — Moshe and Anastasia — where they could exhibit and sell their own leather works while also getting live feedback from customers, has now transformed into this inviting Mediterranean cafe and boutique that sells boho chic jewellery to clothing to various home decor items. We highly recommend their scarves! Amongst Vagator’s lesser-known pockets is this eclectic book store that’s tucked inside an exposed red brick house, which itself is over a 100-years-old. A quaint little bookstore run by Arushi and Sam, Lotus Eaters is a reader’s delight — their whole stock of books in varied languages is pre-owned, and they also buy their books back at half-price. The concept is ideal for people who want to read something for the duration of their stay in Goa, without having to carry the book around for the rest of their travels. Located inside a beautiful Goan house that serves as the quarters for the store in Candolim, The Flame Store is best known for its quirky, chic collection of clothes, jewellery, homeware — amongst these their kaftans in particular, are a crowd favourite. Most of their pieces are handcrafted and exquisitely designed. Organic and heritage fabrics come together to create beautiful breathable clothing that are both classy and timeless as well as perfectly suited for your #vacationgoals. You'll be happy to know that they also have a branch at Thalassa in Siolim. A designer boutique store, located on the Ashvem beach, Alchemy is a culmination of the ‘bohemian meets elegant’ look. The clothes though are on the higher side in terms of their pricing, they work with several organic fabrics like hemp, raw silk, handwoven cotton and other natural fabrics. Curated by designers Fara and Studio Tia, the brand offers beautiful fabrics and is among the must-check-outs in Ashvem. A home decor store that's one-of-its-kind, Karma Collection (located in Calangute and Morjim), has it all — from furniture to cloth notepads, to wind chimes, statues, wall clocks, bags, etc. The store is over a decade-old, and puts emphasis on the quality and individuality of their products, so much so that you may not find replicas of many of them. Their collection of artefacts and wooden furniture, and their collection of tribal clothing and hand-embroidered bags are pretty popular. Gunpowder's equally popular neighbour, Rangeela is as much of a visual treat as it a treasure hunt. It stocks up on apparel, decor, furniture, jewellery, bags and other knick knacks. The way everything's found a spot in this Goan villa evokes a sense of awe and wonder. While you'll find a few curated brands here (Think Baro, Chola The Label and more), a lot of finds are those that the owners have sourced from manufacturers across India and Indonesia. This is why, you're likely to find a lot of things between the INR 500-4k price range.